Recent studies suggest that as many as 50 billion IoT devices will be installed by 2020. The introduction of these devices has already brought a new set of computing challenges, especially in the domains of privacy and security. Just in October of 2016, the world experienced its largest ever distributed denial of service (DDoS) attack. The distributed denial of service attack generated over one terabit per second of data and was carried out by exploiting the lack of security in connected devices. For most researchers, there is simply no, open-source or otherwise, deployable system platform or environment to investigate and experiment with the salient features of these distributed connected systems, in terms of scalability of resources and algorithms, hardware real-time constraint evaluations, bandwidth to computer power trade-offs, resiliency, privacy and security. 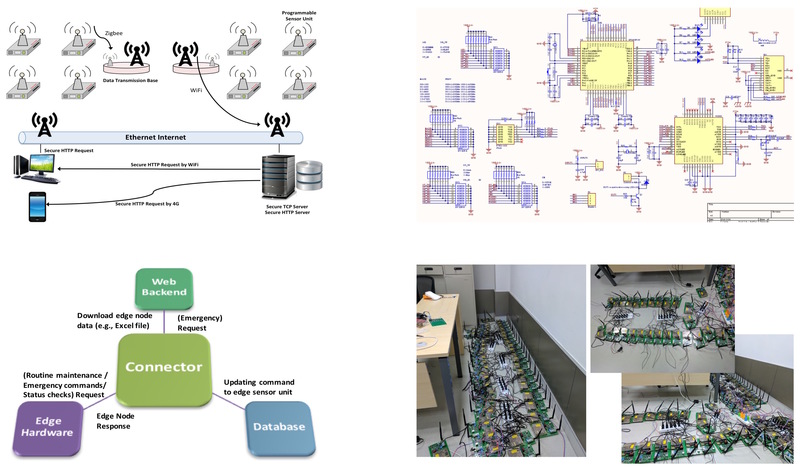 To remedy the situation, our laboratory sets out to design and prototype Odysseus, a robust open-interface Internet of Things (IoT) testbed system architecture. Odysseus will enable researchers to do design space exploring of the edge-computing concept, focusing on different applications, algorithms, hardware-software co-design techniques, and scalability. The Odysseus architecture is a three-layer distributed system. It consists of (1) a set of distributed edge nodes connected to data transmission bases using the Zigbee communication protocol, (2) a pool of the data transmission bases to perform long-distance transmissions, and (3) a server-based backend compute infrastructure. These edge nodes have an open-interface and can support a multitude of programmable sensors. Each data transmission base services a group of edge nodes. The number of the edge nodes in each group/cluster depends on (i) the data collection rate, (ii) collection amount, (iii) allowable delay and (iv) degree of resilience. In the current implementation, edge nodes can support most 3-pin and 4-pin (ground, input, output, and power) sensors and use the Zigbee communication protocol to connect to the communication bases, which use Wifi to connect to the larger Internet. We are currently embarking on the process of re-designing the edge boards for lower power, more sensor support, and to experiment with a tiny RISC-V for the in-situ processing. We are also experimenting with distributed machine learning algorithms and applications. We are looking for collaborators or sponsors - on the application, networking, or hardware design.